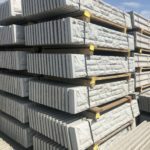 All the concrete gravel boards featured on this page are available from stock with delivery in 2-5 working days. With the exception of the bolt-on gravel boards, 5-10 days for delivery or collection. Available in six inch and twelve inch height variants. For use with feather edge, waney or overlap panels. Please Order the number of cuts required on this form. Then record the length/s required in the comments box. Concrete gravel boards are a great way of adding additional protection to a garden fence whilst also adding a touch of decoration. Oakdale Fencing supply a variety of concrete gravel boards suitable for traditional fence panels and timber fences. 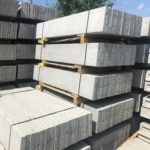 Why use Concrete Gravel Boards? If you are looking to help keep traditional timber fence panels free of rot we stock two heights and widths of 1.8m and 6ft. We stock both six inch high and one foot high reinforced concrete kick boards. Both heights can be purchased with a choice of fascia finishes. Rock face gravel boards offer an extra degree of decoration whilst recessed and plain faced gravel boards offer a nice clean alternative. 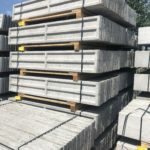 All three types in both height sizes can be dropped into slotted concrete fence posts to fit easily or can be fitted to timber posts by means of a steel bracket. Decorative fence panels can be raised off the ground with our metric gravel board. These can also be used with slotted concrete fence posts or timber posts. We supply these boards in the 6″ and 12″ heights. If you are installing a traditional close board or feather-edge fence we can supply six inch high concrete gravel boards to suit. We offer this variant in two different lengths (2.4m and 3m) dependant on post spacing. This item can be bolted to recessed concrete fence posts by way of a carriage bolt or can be screwed to timber posts.